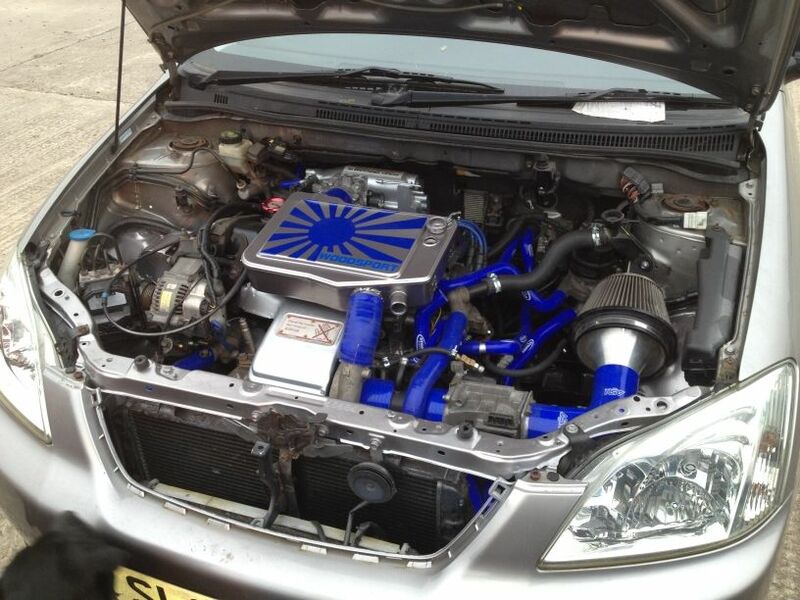 Having converted quite a few roadsters to 2zz power, this one is a very rare conversion being the supercharged version of the 2zz-ge as found in the Corolla T sport compressor and Lotus Exige models. We are in the final stages of converting this one, it should be pretty special. We aren't strangers to Ferrari replicas at Woodsport, in fact i've converted dozens of them in various forms to V6, this one is a little different in that it uses the VVti Lexus Rx300 engine as it's donor. Still a little to do but it also features a twin exit exhaust either side of the number plate. 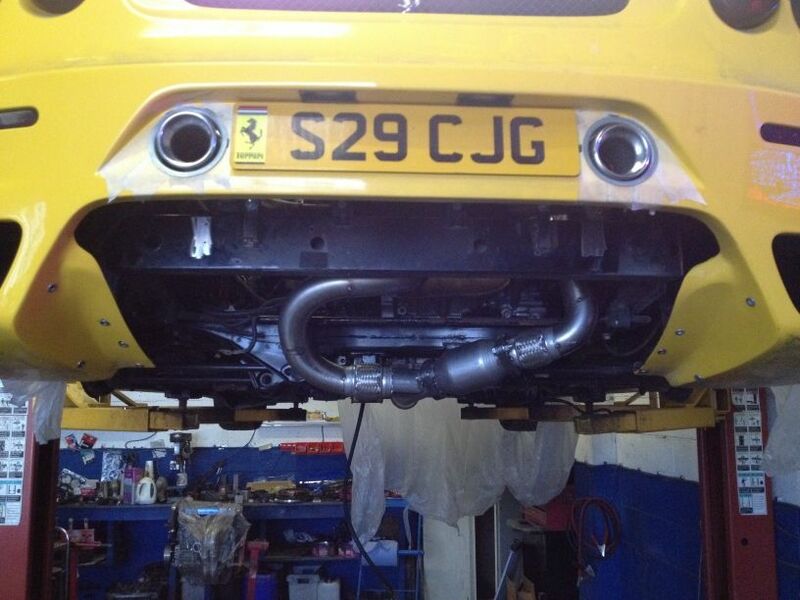 We can cater for all sorts of bespoke custom exhaust work as above. 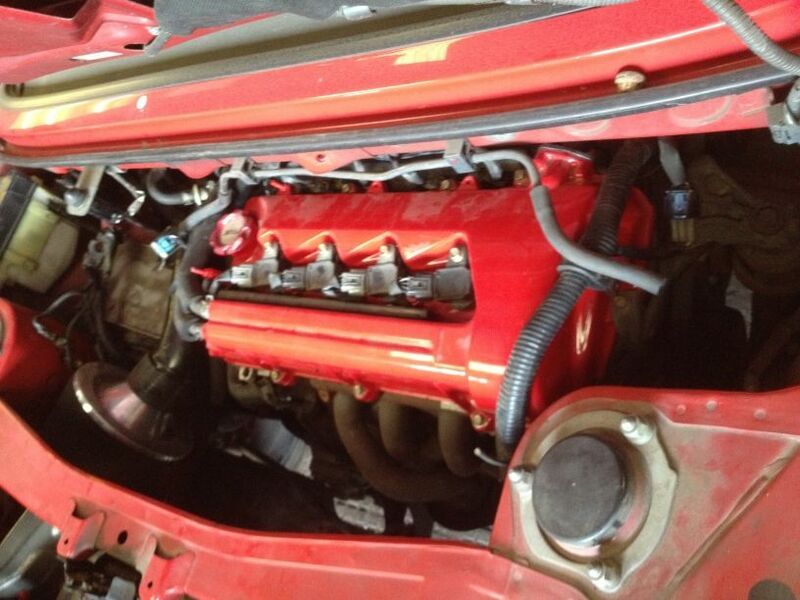 One of my own personal projects this one, i'm shoehorning an Mr2 turbo 3s-gte motor into a Corolla T sport. 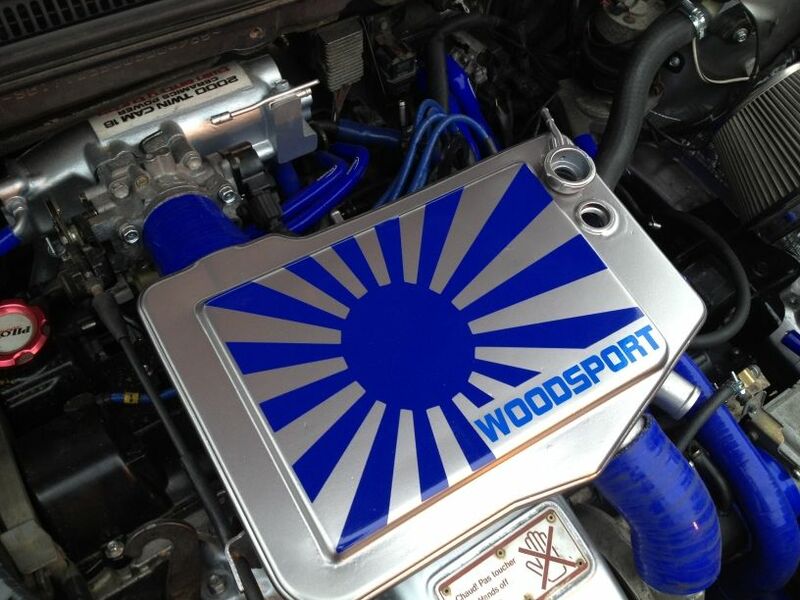 Custom engine detailing work is a specialty here at Woodsport. 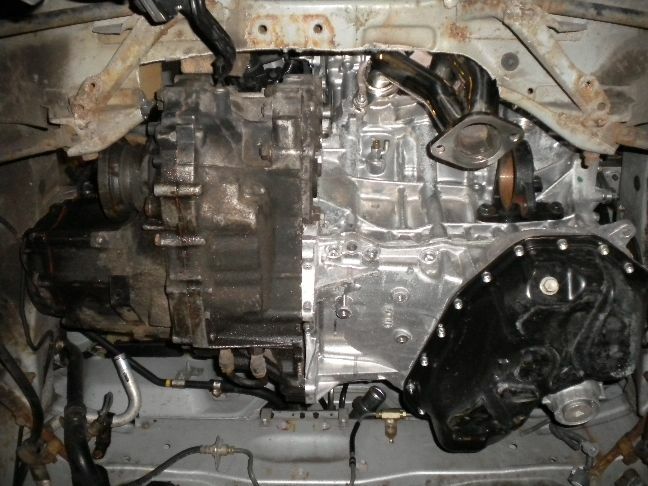 Our latest conversion is the fitting of the awesome 2gr-fe 3.5ltr V6 into the Mr2 roadster chassis, this build will use the Mk2 Mr2 turbo gearbox with LSD (limited slip differential) fitted as standard. We will also be using a Fidanza lightweight flywheel, ACT 6 paddle clutch kit and Berk tubular exhaust manifolds available through Frankenstein Motorworks. In fact the complete 2gr mounting kit is available from Marc at FM but please be aware this kit merely fits the engine, and is intended as a bolt in solution for the Mk2 chassis, it does not allow direct bolting in to the Roadster chassis, we need to make mounting plates on the Roadster chassis for that. 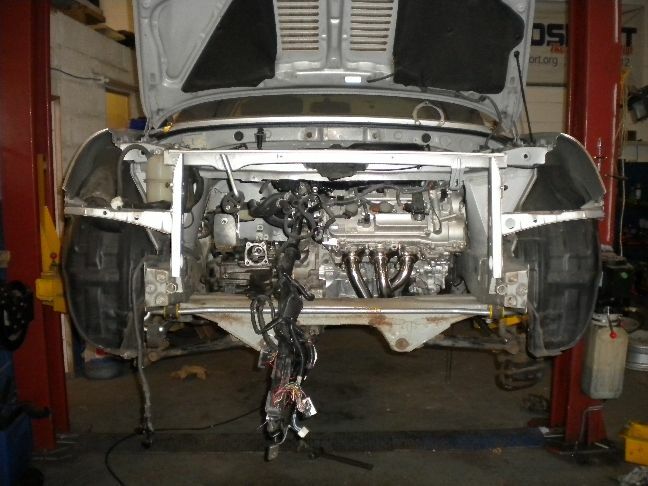 So far we have dummy mounted the engine and an empty gearbox casing for alignment. We have made special modifications to the chassis to allow the tubular manifolds to be used, this is something that has not been achieved before, normally modified stock headers would be used. You can see underneath just how tight space is. This is just the mock up stage, everything will be removed for final cleaning and painting as we do with all our builds. We are also fitting modified rear hubs to this car to allow the complete Mk2 Mr2 Turbo driveshaft with its much thicker outer spline to be fitted. More to come on this, we have another to build very shortly as well, please ask about pricing. We are undertaking a special project for ourselves to see if we can shoehorn a BMW 5.0ltr V12 engine into a Mk2 Mr2 chassis! This will be done without stretching the chassis or moving the rear suspension strut mounting points as is done on Lambourghini Murcielago Mr2 kit builds. This will be attempted without extending the wheelbase at all. 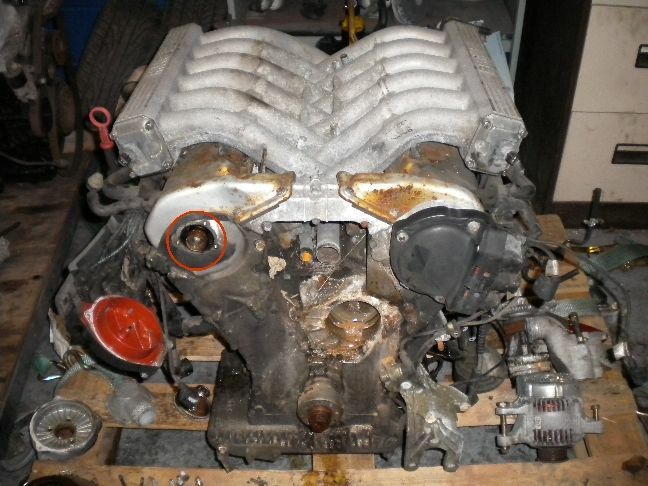 Here is our donor V12 engine, it is just a scrap engine and only being used for trial fitting and component part making. 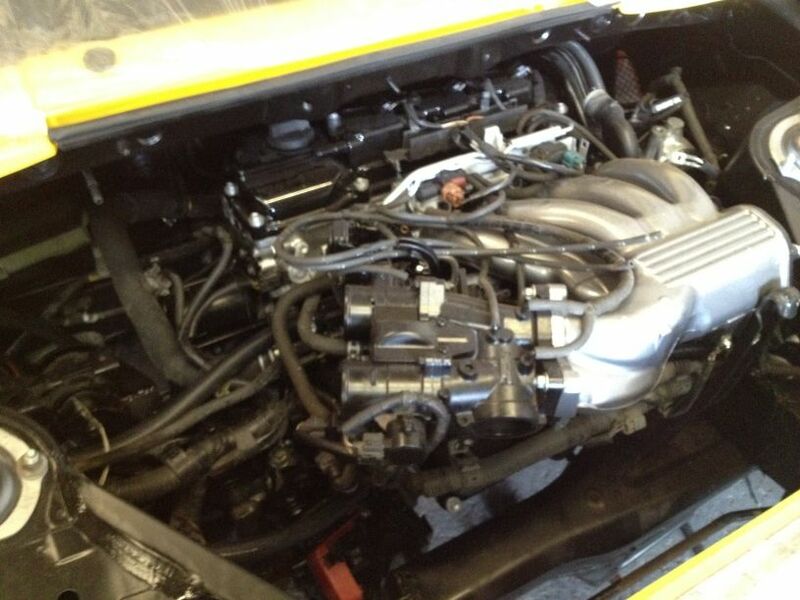 As you can see we have shortened the engine by 2" by removing the distributors and water pump. We will be mounting this engine in a North/South orientation with an Audi 6 speed gearbox attached to it, much like the V8 Mk1 Mr2 project. Just thought I’d write a long overdue update to his project. The engine makes more power and torque at all points in the rev range than the standard 4AGE but it still retains and even enhances the high revving nature that makes the Mk1 MR2 so much fun in the first place. As Paul put it it’s like a Mk1 plus. Since this is my everyday car I also wanted it to cruise well on the motorway, be quiet and return decent mpg. I’m pleased to say due to the standard MK2 backbox, standard Mk1 intake and 6th gear it does indeed cruise more quietly than the standard Mk1 and returns about 40mpg at a steady 70 - 80mph. Handling wise due to the LSD this has improved immensely and in the wet I’m now able to hang the rear out around roundabouts and hold it there on the power in a lovely drift. The 2ZZ engine is very light being all alloy and is lighter than the original iron block 4AGE, this has cancelled out the weight of the extra (6th) gear and has maintained the great balance of the standard Mk1 MR2. Paul fitted a full set of poly bushes for me so next week I’ll have the car fully aligned to the TRD settings which should hopefully sharpen the initial turn in a little. Other than that I may experiment with drilling out the poly engine mounts slightly since at the moment there is a little too much vibration at tick-over due to the ridged nature of the mounts. Overall though as you’ve probably guessed I’m delighted with this conversion… hats off to Paul at Woodsport for not only creating it but also the backup he’s given me since.